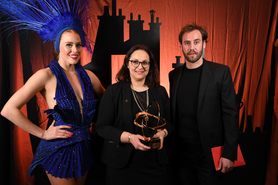 – has won the prize for ‘best foreign tourist office website’ at the French hospitality industry’s ‘Les Travel d’Or’ awards. The Tourism Ireland website, Ireland.com, beat completion from Mauritius, Tunisia, Thailand and the Maldives. The voting was carried out by 221,000 internet users in France and by a panel of web and travel industry experts. This is the fifth time that Tourism Ireland has won a Travel d’Or award from the e-tourism industry in France, winning in 2011, 2012 and 2015 and 2017. Ireland.com is available in 11 different language versions for more than 29 individual markets around the world. In 2018, Ireland.com attracted 20.3 million visitors. Lufthansa was named best airline at the ceremony, while Club Med – represented in Ireland by Sunway – was voted best tour operator.